Fund raising and general up date – I hope Huw is somewhere where he can see how much he is loved and remembered. It means a lot that over the last few months, even as many of Huw’s friends have moved on to Uni and so on, that there is so much to say about recent things that have been going on to remember him. 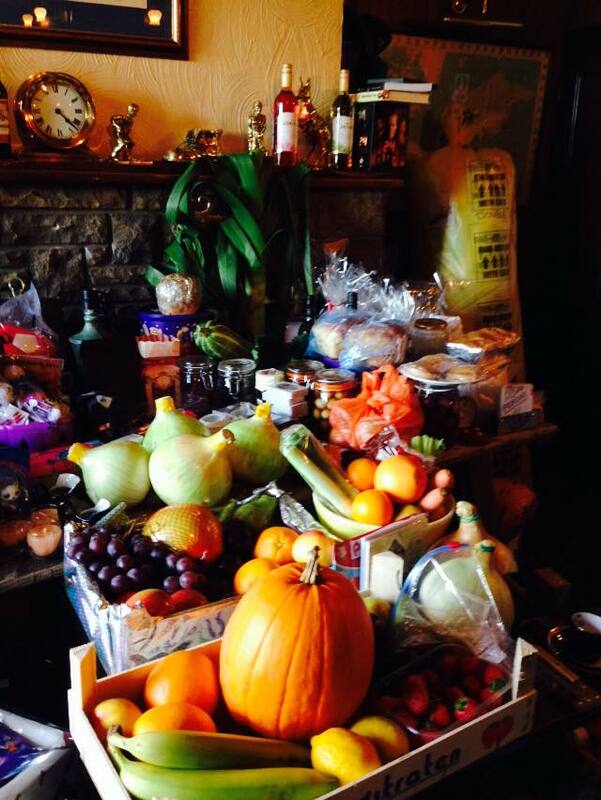 Firstly a fantastic donation from the proceeds of the Boot and Shoe Inn harvest auction – some of the items auctioned are pictured here. Customers at the pub were asked to choose the charities the auction would support this year, and they chose Huw’s trust as one of the main recipients. They raised £2,470 with a superb £1,000 going to the Trust. I won’t list all the people who go to the Boot and Shoe in Scholes who knew Huw directly or through their families as I’d be here all night – but when I went to see Debra tonight it struck me how many people there knew him and about the charity work. Thank you so much to Debra Whitely, Tonie-Marie, John (the auctioneer), and Huw’s friends Lucy, Meg, Isaac, and Eddie who were all involved – but most of all to the very generous people who donated items and who put in fantastic bids for the items. I can tell from what I know about these auctions that to raise that much money must have been the result of a lot of generosity – I am glad everyone thinks it is worth it both to remember Huw and to raise money for a great cause. The money raised will be used to help fund new physiotherapy kit at Daniel Yorath House in Leeds and I will have photos and more details on that soon. Earlier in the year a group of friends involved with Upperthong Football Club (including a teacher from Huw’s school) completed a sponsored bike ride covering the cross Pennine Coast to Coast 140 mile route in 2 days at the end of June, raising funds for two charities. 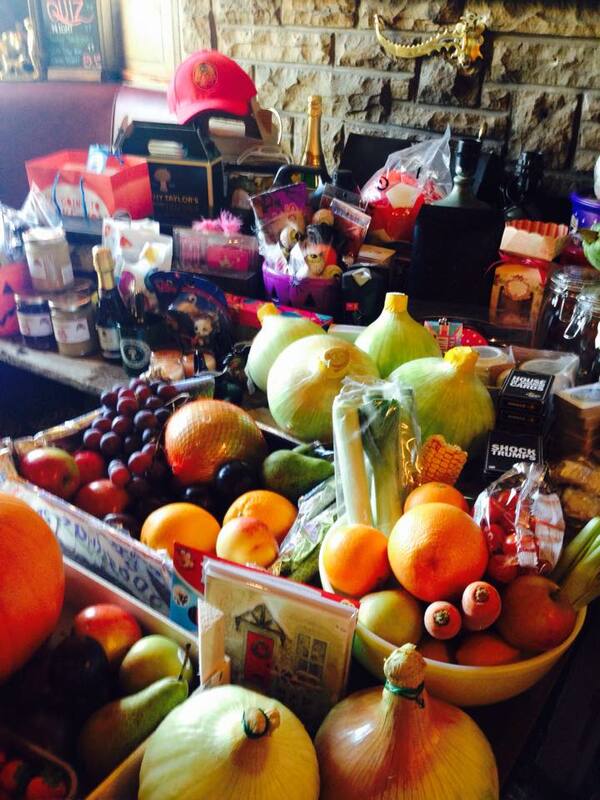 This resulted in a donation of well over £600 which will also be used for the physio kit at Daniel Yorath House. 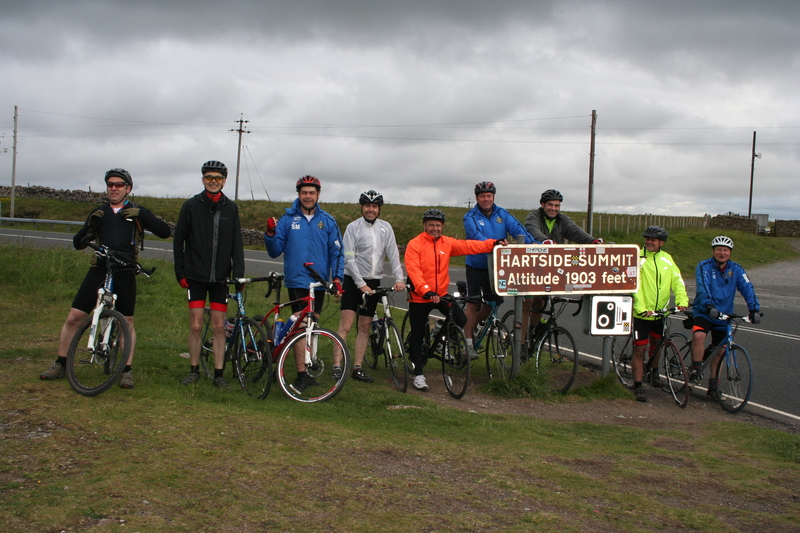 Here are pictures of the group leaving Whitehaven and also at the half way point at Hartside Pass – a superb effort doing that route in 2 days which also has memories for my family. Carys, me and other members of Huw’s family were part of a large group who completed the same route in 2011 – being part of a group to remember Huw in that way was inspiring, but also so emotional having been parted from Huw earlier that year. 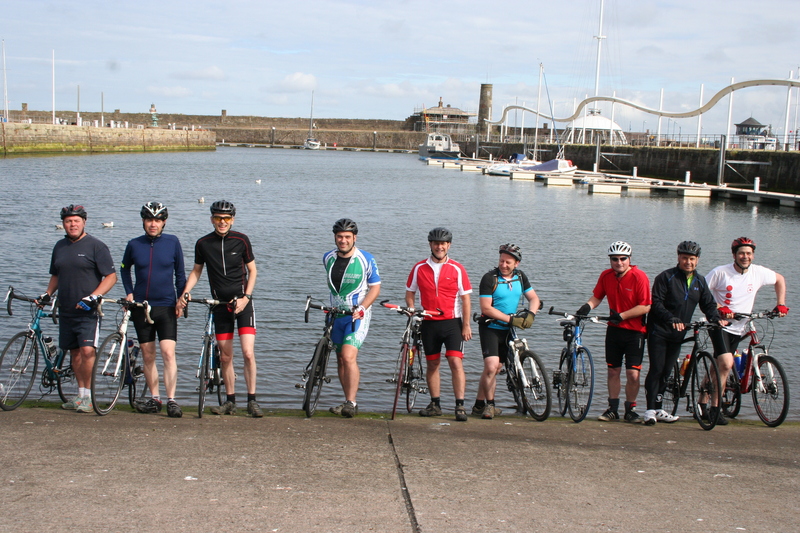 Seeing this group completing the route in 2014 is amazing – people still remembering Huw and supporting the Trust. Thank you so much and well done to Andy Bullingham, Ian Woods, Chris Douglas, Andy Hallas, David Horne, Charlie Wilson, Allan Gates, Simon Procter, and Shaun Mabey. These activities mean that the Huw Thatcher Trust is now approaching the £100,000 mark and I will have more to say about this on his 19th birthday in November. 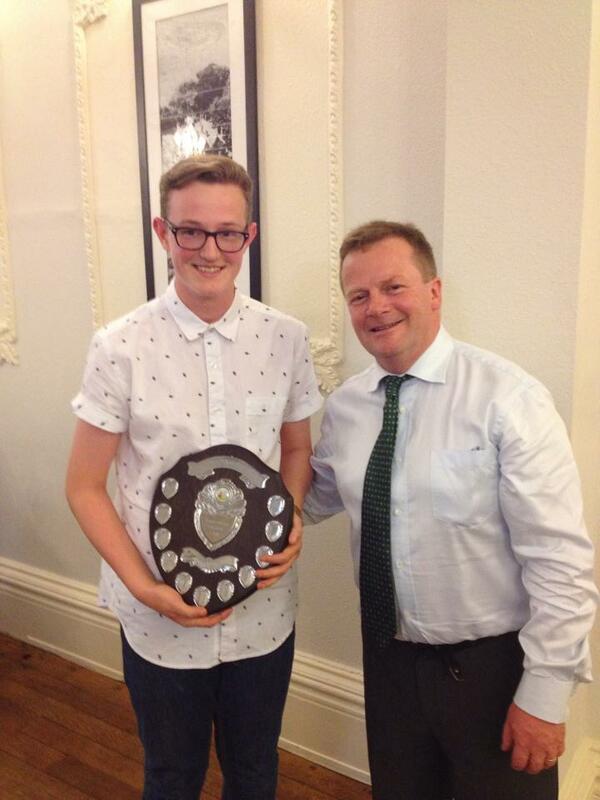 Earlier this month the Huw Thatcher Pride and Passion shield for the 15 year old section of Upperthong Cricket Club was presented to Max Harris. Max plays cricket much like Huw did – a leading batter in his age group and who also played a key part in the Huw Thatcher football tournament in July. In fact all 4 members of the Harris family have always been great supporters of the Trust ever since March 2011. Well done Max and thank you to Max and the rest of his family. In fact Max’s Dad Steve is a keen runner and I will be saying more soon about a key running challenge next year for the Trust and that’s something that Steve among others are planning to be involved in. That will be when I have recovered from a knee injury which is now on the mend – and I want to say thank you to Alan for his time and effort helping me with the recovery. Alan is a fantastic and generous guy who helped Huw with injuries some years ago and who continues to support me and my family with injuries. I would certainly have been struggling to do the cycling challenge earlier this year and the running next year without Alan’s help. Huw would be comforted if he is looking down on others like Alan in the community who are supporting his family or raising funds in his name and memory. My update wouldn’t be complete without an update on the trials and tribulations of Cardiff City. It has been a mixed start to the season for the Bluebirds, although things have looked up over the last couple of weeks. But despite the results, Carys and I continue to get great comfort and pleasure from watching Cardiff – most recently away at Blackpool where we had also watched City play in August 2009 with Huw when the 3 of us had a fantastic day out. The most evocative times are when City do well – I guess that’s because we can imagine Huw jumping up with us when City score. While that hasn’t been quite so often this season, Huw’s favourite player (Peter Whittingham) has scored trade mark long distance goals in the last two games and whenever he does that it sends a shiver down my spine as I remember Huw celebrating Whitts’ goals (left-footed like Huw of course) with me so many times a few years ago. A big thank you to everyone for whatever they have done over the last few months – whether it is fund raising, friendship, or memories of Huw. And finally, to say I love to hear about what Huw’s friends are up to – whether it is at Uni or elsewhere – and good luck to all of them as they continue with whatever new things they are doing this Autumn. 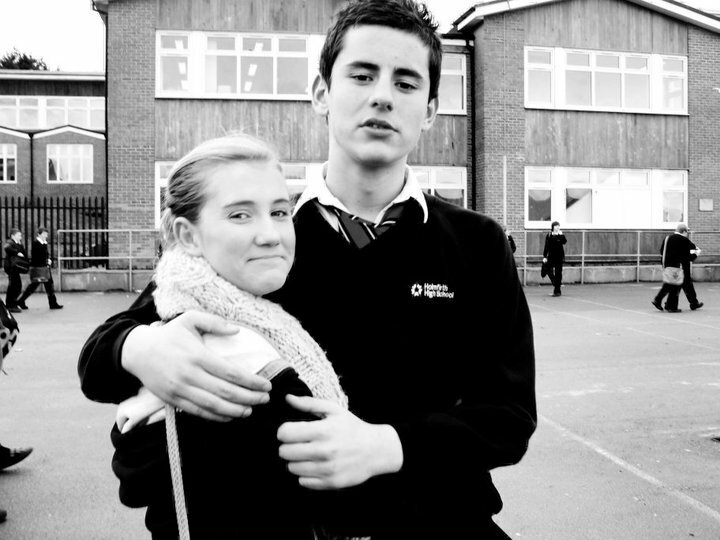 Here is our 15 year old boy (with Lucy who was involved at the Boot and Shoe), who should be approaching his 19th birthday and experiencing those new things with them – I hope he is somewhere where he can realise how much he is loved and remembered by all of us.